Google+ has had problems with spam since... well, forever. If you regularly encounter spam on the platform, at least Google has now made it easier to deal with the problem. 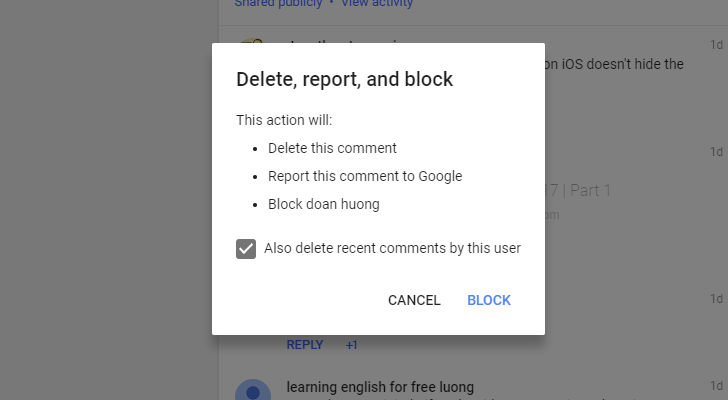 The company is rolling out a new 'delete, report, and block' button for comments to help you quickly get rid of spam replies. Leo Deegan, an engineer manager at Google, announced the new feature on his G+ account. It's similar to the 'remove, report, and ban' option given to community moderators a while back, but this is for normal users. The new option is still rolling out (I personally don't have it yet), and it doesn't appear to be in the mobile apps yet. There's also an option to delete recent comments made by the user, but it only applies to comments made on your own posts. You can see the original announcement at the source link below. The 'delete, report, and block' button has now been added to the Google+ Android app, too.